During a massive rally held in Seoul on the afternoon of Nov. 12, protesters fill the streets from Gwanghwamun Square to Seoul Plaza in front of City Hall, lighting candles and calling for South Korean President Park Geun-hye to step down. 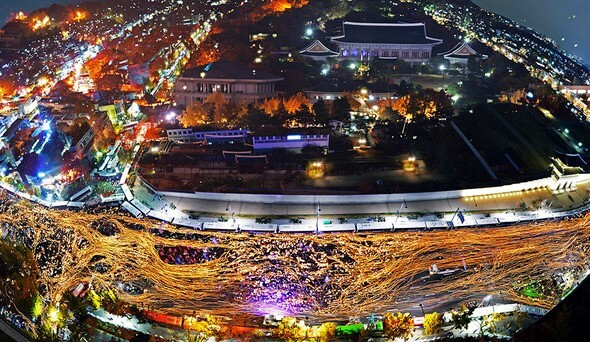 One million people – it was the most people to congregate in downtown Seoul since the democratization movement in June 1987. The four streets that converge at the Gwanghwamun intersection twinkled with the glow of candles and cell phones held aloft by demonstrators. 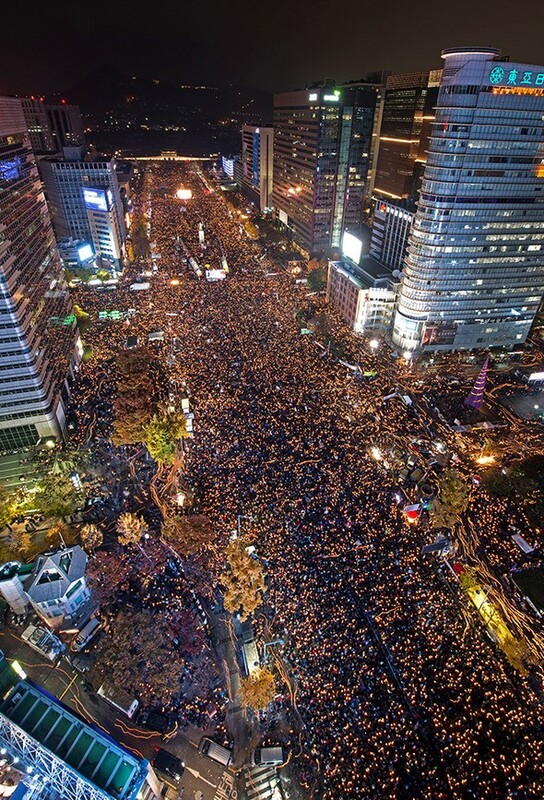 On the evening of Nov. 12, “the politics of the public square” was truly at work in downtown Seoul. At the Blue House on Nov. 12, all officials with the rank of senior secretary and higher were on emergency duty and were periodically holding internal meetings. The people inside the Blue House must have heard the roar of the crowds, too. While President Park Geun-hye refuses to even step back into a secondary role in the government, a million candles made clear that the majority of the public call for her resignation. Protesters holding candles marching toward the Blue House, located near Gyeongbok Palace in Seoul, are blocked by a barricade of police buses, Nov. 12. The protesters were participating in the third candlelit rally demanding the truth about the Choi Sun-sil scandal and the resignation of South Korean President Park Geun-hye. According to the organizers, more than one million people took part in the protest (the police place the figure at 260,000). This far exceeds the candlelit vigils for mad cow disease in Seoul in 2008, which maxed out at 700,000 people. Indeed, it is the biggest demonstration in 29 years, since a million people attended the funeral of Lee Han-yeol, a student at Yonsei University who was killed by a police tear gas canister, on June 9, 1987. The organizers of the protest said that 60,000 people also gathered in 10 other cities around the country, including 35,000 in Busan, 5,000 in Jeju, 10,000 in Gwangju and 4,000 in Daegu.